Icebergs, Puffins and Whales – Oh my! Where Mother Nature’s theatre is only a few steps away. From icebergs to whale watching, exploring the expanse of the natural surroundings can be done by boat or foot. The numerous walking trails give you a bird’s-eye view of St. John’s in all its splendour including Canada’s most easterly point, Cape Spear, a historical landmark that offers views of the first sunrise hitting our shores. Our tour around the hills on the other side of the harbour on Signal Hill to get a 360 view of St. John’s. Hop in a sea kayak and paddle alongside the majestic creatures that flock to our shores. The saying “you’ll have a whale of a time” rings true for us, as we welcome upwards of 10,000 humpbacks to our coast during their feeding season. 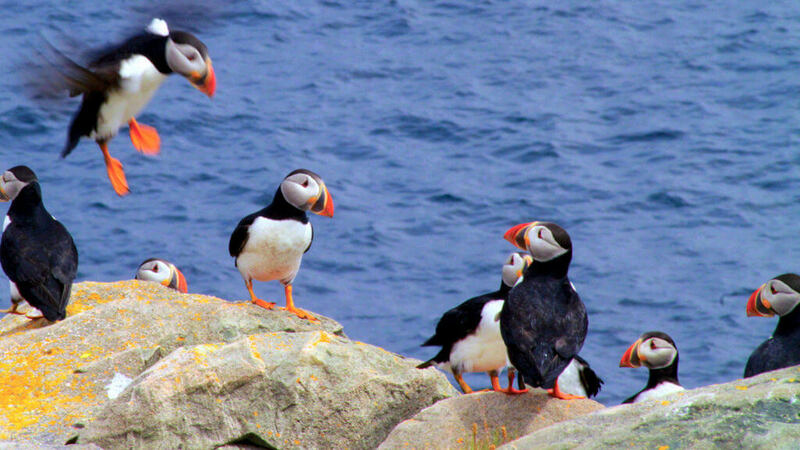 While on the open ocean, you may also spot our mascot, the puffin. These unique birds flock to our shores to nest and raise their young before heading back out to the open ocean for eight months. A photography tour can showcase the glistening icebergs that travel to us from western Greenland. These 10,000-year-old artifacts take about 2-3 years to travel to what we call “iceberg alley” – our very own theatre that showcases the spectacular colours from snow white to rich blues. Put simply, St. John’s is one of the best places in the world to see icebergs up close and from afar. Story Ideas Storytelling is a part of our culture. From Land and Sea to Table Across the country, restaurants and people alike are embracing the “farm to table” revolution where fresh is best. There’s A First Time for Everything From forward thinkers to risk takers, people have flocked to St. John’s to make history for themselves and the city. Tongue In Cheek Newfoundland is known for colourful language. Exploring the Great Indoors In St. John’s, we’re known for our wide-open spaces and that includes our indoor experiences as well.